Tons of practical ideas for K-12 teachers to get the most from innovative tools. So, while yesterday's "experiment" wasn't really that new or from scratch, today's certainly qualifies. "Students 2.0" is a brainstorm that has been growing for the last few months, and which started in a small restaurant with Jenny Luca telling me she wanted to teach a class on social media to students who might not otherwise be taught about blogs, wikis, and social networking in the context of building their own learning experiences. We brainstormed that evening and online, and the idea was actively simmering when I visited with Jackie Gerstein in Philadelphia after she'd presented at Educon 2.2 on "User-Generated Education." I realized that, for me, this was more than just about teaching the tools of Web 2.0 to students--it was about a mind-shift in thinking about how involved students can/could/should be in the shaping of their own educations. Of course, I've been well-prepared for this moment. My original interview series at EdTechLive was with many of the superstars of the Open Source Programming world, all of whom did important work at a young age that was outside of their traditional schooling, but involved apprenticeship, mentoring, and communities of practice. My oldest daughter chose to homeschool herself and became a serious scholar of Shakespeare and other great literature, so I'd seen a student be a self-motivated scholar when provided with the right kind of mentoring and opportunities. I'd interviewed Arthus early on as well as the gang at the original Students 2oh project that Clay Burrell had facilitated, and I'd appreciated the work of Sylvia Martinez at GenYES supporting students being actively involved in tech support and teaching teachers. So the idea of some group of students actually being capable of driving their own learning made a lot of sense to me. I've scheduled a series of "Students 2.0" events at FutureofEducation.com to discuss this topic. We start with Robert Epstein to talk about his tome, Teen 2.0 , and the idea that adolescence is a historically unique construct that, it can be argued (and I think he does), severely limits the inherent capabilities of teens. I have to say, I'm desperate to plunge into the book, and can't wait for the interview. Then Jackie Gerstein is going to come on and give us that presentation on "User-Generated Education," followed by Michael Furdyk, a teenage entrepreneur who then became one of the co-founders of the impressive TakingITGlobal. In June Elizabeth Kanna is going to speak on "Real World Student Preparation" and Jennifer Openshaw will speak on "What Every Parent, School, and Student Should Know: Preparing Our Kids for a Global Economy." Hopefully we'll draw in the good folks from Science Leadership Academy and other schools providing students with opportunities to shape their own learning--and send me your suggestions for other speakers! We're launching Students 2.0 as a social network. Here's our vision: "Students 2.0 is a network for you to connect independently with other students and with mentors to shape your own educational paths and experiences outside of traditional institutions. It's a place to explore passionate interests, build professional competencies, and form your own Personal Learning Network (PLN)." The site is very much still in brainstorm mode, so please encourage students and mentors/educators to join and help us make something significant. Jenny Luca is scheduling a "Learning Web 2.0 Series" for students that will be held in Students 2.0 and live in Elluminate, and which will start on April 21st and go eight weeks. She'd love some help, and we hope that this is just the start! As you can imagine, we've got lots of big ideas and really want to share them. This should be interesting! Still to come: tomorrow - Aula 2.0, Friday - EduBloggerCon, OpenSourceCon, and GlobalEdCon. This is day two of a week of experimenting with social networking projects, and I'm cheating a bit. But for a good cause. Library 2.0 was started by Bill Drew in early 2007, a few weeks before I fired up Classroom 2.0. We kept in touch, and every so often we would correspond about our experiences running educationally-oriented social network. Some weeks ago I read that Bill was struggling with a spam problem on his network and had decided to shut it down. I emailed him and mentioned that I'd developed something of a system for dealing with spam on my networks, and asked if he would like me to help him or take the network over. It seemed a shame to think the network would be shutting down--first, because there were over 4,500 members, and second, because of my belief that librarians are a great model for the expanded role teachers will have in a Web 2.0 world. Bill opted to have me take over the network, so I purchased the Library20.org domain name and set about to find a sponsor to remove the advertisements. Thanks to Elisabeth Abarbanel and Buffy Hamilton and the other librarians at Brentwood School, who generously stepped forward to sponsor the monthly fees from Ning, Library20.ning.com was seamlessly reborn last week as Library20.org. Wahoo! So, in truth, Library 2.0 is not really an experiment and it didn't really happen today, but in a larger sense it really is part of this week of expanding projects--so we'll claim it anyway. And it is worth highlighting, so I hope you'll come visit or join the site if you are a librarian interested in the use of Web 2.0 and Social Media. The time of the events below will show up automatically in your own time zone when you are registered in LearnCentral and when you have chosen your time zone in your profile. Event recordings are posted and available after the events if you aren't able to attend them live. Be on the lookout for Australia-time-friendly events as part of the new Australia Series! I also hope you'll consider hosting your own public webinars using the LearnCentral public room--instructions are available by joining the "Host Your Own Webinar" group on the main announcement tab (http://www.learncentral.org/group/3432/host-your-own-webinars). Join me for a live and interactive interview with Sir Ken Robinson, author of The Element: How Finding Your Passion Changes Everything. "E-blends and Regional/Remote Students Overcoming the Challenges" with Jo Hart. This will be an interactive session aimed at exploring some of the challenges (and some possible solutions) of using e-learning blends for flexible delivery to a highly diverse and geographically scattered student group across four AQF levels of literacy, numeracy and study skills. "Cultivating Communities of Practice: Analysis of 3 Case Studies Using the 7 Principles" with Sylvia Currie, Patricia Delich, and Paul Stacey. "In this session we will describe 3 case studies using Wenger, McDermott, & Snyder's (2002) 7 Principles for Cultivating Communities of Practice. This framework provides a close look at how our decisions about community design and technologies to support community activities were made and revised, as well as a consistent and rich view to help those involved in online and hybrid communities learn from our experiences." 30 minutes. "Blended Work – Experiences From International Development Project" with Susan Chrichton and Azra Naseem. "We know about blended learning but what about blended work? When we use learning tools in academic work place applications, what changes and what are the challenges? This seminar shares the authors’ experiences from the last fourteen months as we’ve navigated the virtual terrain connecting colleagues in Pakistan East Africa, the UK and Canada. Trust us, time zones weren’t the biggest challenge!" 30 minutes. "Blogging for Beginners" with Lorna Costantini and Kim Caise. Designed for participants new to blogging. Students will create a blog hosted at Weebly.com. Concepts covered - reading and writing a blog post, adding images, embedding video, what is an rss feed, and using a feed reader to monitor blog posts and comments. "Connecting Concepts – Biology Classics Award" with Jan Cheetham. Students play the role of predators on moths on a tree trunk. Then, they play the role of biologist, analyzing the changing gene frequencies of the moth population and determining if the population evolved over three generations. Students will: 1) collect data by “eating” moths; 2) calculate gene frequencies for each phenotype over three generations; 3) interpret graphs of data their data to determine if microevolution occurred; and 4) explain how selection acts on populations. "Edublogs Serendipity - Unconference Session" with Jo Hart. "Join us in our fortnightly unconference sessions. Bring along the burning issues and hot topics YOU would like to discuss. Topic is chosen by poll at the start of the session." "Texas Language Technology Center – World Languages Classics Award" with Carl Blyth. The Texas Language Technology Center is a model for innovation in technology-enhanced learning materials to teach languages. Many of its projects have won prestigious awards already and several have received five-star peer reviews in MERLOT, such as Tex’s French Grammar, Le Francais interactif, Ta Falado and Spanish Proficiency Exercises. "MathOverflow." Anton Geraschenko, the founder, will present the research mathematics question and answer community MathOverflow. The "Education for a Digital World 2.0" series kicks off Wednesday, March 30th, with two sessions. This series is a part of the LearnCentral public Webinar program and FutureofEducation.com. 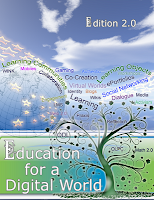 The collaboratively authored book, Education for a Digital World 2.0, and its predecessor Education for a Digital World represent a shift in how educators are sharing their research, experiences and best practices in online teaching and learning. Join us as we talk with individual authors about their contributions and the global online collaborative writing journey. Description: "In this session we will describe 3 case studies using Wenger, McDermott, &; Snyder's (2002) 7 Principles for Cultivating Communities of Practice. This framework provides a close look at how our decisions about community design and technologies to support community activities were made and revised, as well as a consistent and rich view to help those involved in online and hybrid communities learn from our experiences." Description: "We know about blended learning but what about blended work? When we use learning tools in academic work place applications, what changes and what are the challenges? This seminar shares the authors’ experiences from the last fourteen months as we’ve navigated the virtual terrain connecting colleagues in Pakistan East Africa, the UK and Canada. Trust us, time zones weren’t the biggest challenge!" I've always wished there were an easy way to start discussions around a book using a social networking platform, but without requiring starting a whole new network. If you have a class, team, group, or other set of people wanting to hold an online book group, or to have an online component to a book group you are currently running, BookDiscussions.com is my attempt to provide a solution. This site is very much a "work in progress," so your feedback and help are most encouraged! By virtue of other pressing projects, BookDiscussions won't get a lot of attention from me right now, but I didn't want to delay in making it available to others who might benefit from it. In the same breath, let me say that if there is someone for whom this is a real passion and you want to help somehow, let me know so I can bring you into the mix here! Because I'm pretty dedicated to the education space, BookDiscussions will be first and foremost a student/family-friendly site, so please keep the language clean. I've started a group right off the bat for Sir Ken Robinson's The Element for those planning on attending or listening my interview with him tomorrow night. To set up a book discussion, click on "Book Groups" at the top of the site and then "Add a Group." You'll have some choices about your group--a good starting place is to choose the "Discussion Form" and "Text Box" features to start with, and then decide if you want anyone to be able to join or only those you accept (safest). I do not recommend that you allow the option for members to send messages to the entire group. Because book discussions groups are often for a particular audience, there can (and should) be more than one group for any book. I'm going to start seeding the network around the book authors I interview at my FutureofEducation.com and Conversations.net series. These are live events held in Elluminate. If you want to hold your own free, live, public events to do the same, more information is at the Host Your Own Webinar Group in LearnCentral.org or contact me directly. Location: In Elluminate. http://tinyurl.com/pbscr20 If you haven't used Elluminate before, you can make sure your computer is configured correctly to enter the room by going to http://www.elluminate.com/support. On Wednesday, April 7 at 8 p.m. EDT, Classroom 2.0 and PBS Teachers will host a webinar entitled, "A Fresh Look at Teaching The Diary of Anne Frank." Webinar participants will get a sneak peek at the all-new adaptation airing on Masterpiece and review educator materials created for middle and high school. These materials include a teacher's guide created in collaboration with the Holocaust education organization Facing History & Ourselves as well as an omnibus Resources Listing, which collects the best existing resources on Anne Frank and her historical context and offers resources for teens interested in journaling with digital media. Speakers include the author of the teacher's guide and an educator from Facing History and Ourselves. On Monday, April 5 at 8 p.m. EDT, PBS Teachers and Classroom 2.0 will host the next webinar in our PBS Teachers Live! series: "Celebrating the 40th Anniversary of Earth Day." During this event, participants will learn about two new PBS projects: "Earth Days," a film by Robert Stone chronicling the history of the modern environmental movement, and Growing Greener Schools, a film and educational resources aimed at empowering students, teachers and parents to incorporate green ideas into both school buildings and classroom curricula. Presenters include the filmmakers and educational experts who will provide resources and strategies to help teachers celebrate this important anniversary in innovative and meaningful ways. Dan Woodhouse is a 21-year-old disabled and home-based learner in the UK who will be presenting early Monday morning in Elluminate on his use of his computer and the Internet to carry out his studies and recreational activities. He spends most of his day in his bed. 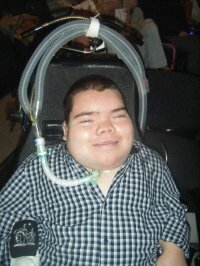 He is an exceptional and very determined 21year old who is permanently connected up to a ventilator; he should not be able to speak, but he can. He has persevered and can now control the complex, ventilator driven, air flow such that he has a voice. He is a home-based learner who wants to communicate with others; he wants to participate and contribute. He has his own views, aspirations and ideas that he wants to share. He recognises the potential of learning to ‘free’ him from his room and actively seeks out opportunities to learn. He is looking towards the collaborative, participatory Web for a solution. A solution that would, and already has, transformed the way he learns, communicates and participates. I have decided to create a live online presentation and Q&A with regards to my outlook on life, the future and everything. I will be talking about my personal history and circumstances, my hopes and ambitions for the future and how I currently utilise the internet and my pc to carry out my studies and recreational activities. We hope that you will consider forwarding this ‘invitation’ to anyone in your personal learning network who you think might want to support Dan or contribute to how "Social Software/tools might help a home-based learner." Location: In Elluminate. Log in at https://sas.elluminate.com/d.jnlp?sid=lcevents&password=Webinar_Guest. The Elluminate room will be open up to 30 minutes before the event if you want to come in early. To make sure that your computer is configured for Elluminate, please visit http://www.elluminate.com/support. Recordings of the session will be posted within a day of the event at the event page. Join me for a FutureofEducation.com live and interactive interview with Tony Wagner, author of The Global Achievement Gap: Why Even Our Best Schools Don't Teach The New Survival Skills Our Children Need--and What We Can Do About It . Location: In Elluminate. Log in at http://tr.im/futureofed. The Elluminate room will be open up to 30 minutes before the event if you want to come in early. To make sure that your computer is configured for Elluminate, please visit http://www.elluminate.com/support. Recordings of the session will be posted within a day of the event at the event page. "Despite the best efforts of educators, our nation's schools are dangerously obsolete. Instead of teaching students to be critical thinkers and problem-solvers, we are asking them to memorize facts for multiple choice tests. This problem isn't limited to low-income school districts: even our top schools aren't teaching or testing the skills that matter most in the global knowledge economy. Our teens leave school equipped to work only in the kinds of jobs that are fast disappearing from the American economy. Meanwhile, young adults in India and China are competing with our students for the most sought-after careers around the world. "Education expert Tony Wagner has conducted scores of interviews with business leaders and observed hundreds of classes in some of the nation's most highly regarded public schools. He discovered a profound disconnect between what potential employers are looking for in young people today (critical thinking skills, creativity, and effective communication) and what our schools are providing (passive learning environments and uninspired lesson plans that focus on test preparation and reward memorization). "He explains how every American can work to overhaul our education system, and he shows us examples of dramatically different schools that teach all students new skills. In addition, through interviews with college graduates and people who work with them, Wagner discovers how teachers, parents, and employers can motivate the 'net' generation to excellence." TONY WAGNER has served as Co-Director of the Change Leadership Group (CLG) at the Harvard Graduate School of Education since its inception in 2000. An initiative of the Bill & Melinda Gates Foundation, CLG is a "R & D" center that helps teams to be effective change leaders in schools and districts. He also was on the faculty of the Executive Leadership Program for Educators, a joint initiative of Harvard's Graduate School of Education, Business School, and Kennedy School of Government. Tony consults widely to public and independent schools, districts, and foundations around the country and internationally and served as Senior Advisor to the Bill & Melinda Gates Foundation for eight years. Tony has worked for more than thirty-five years in the field of school improvement, and he is a frequent keynote speaker and widely published author on education and society. Prior to assuming his current position at Harvard, Tony was a high school teacher for twelve years; a school principal; a university professor in teacher education; co-founder and first executive director of Educators for Social Responsibility; project director for the Public Agenda Foundation in New York; and President and CEO of the Institute for Responsive Education. He earned his a Masters of Arts in Teaching and Doctorate in Education at Harvard University. Tony's publications include numerous articles and four books. Tony's latest book, The Global Achievement Gap: Why Even Our Best Schools Don't Teach the New Survival Skills Our Children Need-And What We Can do About It was recently published by Basic Books and will soon be translated into Chinese. His other titles include: Change Leadership: A Practical Guide to Transforming Our Schools; Making the Grade: Reinventing America's Schools ; and How Schools Change: Lessons from Three Communities Revisited . Join me for a live and interactive interview with Sir Ken Robinson, author of The Element: How Finding Your Passion Changes Everything . Sir Ken Robinson, PhD is an internationally recognized leader in the development of creativity, innovation and human resources. He has worked with governments in Europe, Asia and the USA, with international agencies, Fortune 500 companies, and some of the world’s leading cultural organizations. In 1998, he led a national commission on creativity, education and the economy for the UK Government. ‘All Our Futures: Creativity, Culture and Education’ (The Robinson Report) was published to wide acclaim in 1999. He was the central figure in developing a strategy for creative and economic development as part of the Peace Process in Northern Ireland, working with the ministers for training, education enterprise and culture. He was one of four international advisors to the Singapore Government for its strategy to become the creative hub of South East Asia. For twelve years, he was Professor of Education at the University of Warwick in the UK and is now Professor Emeritus. He has received honorary degrees from the Open University and the Central School of Speech and Drama; Birmingham City University, Rhode Island School of Design, Ringling College of Art and Design and the Liverpool Institute for Performing Arts. He has been honored with the Athena Award of the Rhode Island School of Design for services to the arts and education; the Peabody Medal for contributions to the arts and culture in the United States, and the Benjamin Franklin Medal of the Royal Society of Arts for outstanding contributions to cultural relations between the United Kingdom and the United States. In 2005 he was named as one of Time/Fortune/CNN’s Principal Voices. In 2003, he received a knighthood from Queen Elizabeth II for his services to the arts. He speaks to audiences throughout the world on the creative challenges facing business and education in the new global economies. His new book, a New York Times Best Seller, ‘The Element: How Finding Your Passion Changes Everything’ (Penguin/Viking 2009) is being translated into sixteen languages. Sir Ken was born in Liverpool, England as one of seven children. He is married to Therese (Lady) Robinson. They have two children, James and Kate, and live in Los Angeles, California. MERLOT and Elluminate are coordinating a MERLOT Series on my Future of Education site: http://www.FutureofEducation.com. The series will feature MERLOT Classic Award winners from the 2008 and 2009 MERLOT International Conferences. The authors of these exemplary materials will describe their sites and the rationale for developing the site. The event will be co-hosted by Cathy Swift (MERLOT Director of Academic Partner Services) and me. The webinars are live and interactive, and typically are one hour long--allowing for a live Q&A after the presentation. All of these will be at 8 PM Eastern/ 7 PM Central/ 6 PM Mountain/ 5 PM Pacific. This site is a collection of quick classroom demos that enhance the learning of mathematics content through animations, experiments etc. Each demo comes with stated objective, prerequisites, instructor notes and platform info, plus the level of the demo and credits. This setup appears conducive to quick inclusion into a class. David R. Hill is a Professor of Mathematics in Temple University’s College of Science and Technology. He came to the Temple University in 1973 after earning a B.S. Ed, Mathematics from Indiana University of Pennsylvania, a M.A. in Mathematics from SUNY Buffalo, and a Ph.D. in Mathematics from the University of Pittsburgh where his thesis was in numerical analysis. Between the M.A. and the PhD. he worked for a diversified manufacturing company as a computer analyst. He has also been a Visiting Professor at the University of the Virgin Islands. Dr. Hill has taught a wide variety of graduate and undergraduate mathematics courses including numerical analysis, linear algebra, differential equations, calculus, and general education mathematics. He started developing and using instructional technology on an Apple II and has subsequently used a variety of technologies including MathCAD, Excel, Flash, and in particular MATLAB for instruction. He has co-authored books on linear algebra which incorporated technology in several different formats and has emphasized the use of MATLAB in upper divisional courses. He has also given a number of invited talks and contributed to conference proceedings on topics involving the integration of technology in teaching mathematics. Lila F. Roberts is Dean of the College of Information and Mathematical Sciences and Professor of Mathematics at Clayton State University. Although most of her time these days is spent with academic administration, she enjoys investigating the use of various technologies for teaching and mathematics, including handheld devices such as iPods and iPhones. While she was a faculty member at Georgia Southern, she received an Award for Excellence in Contributions to Instruction. The Demos with Positive Impact project has received recognition from the Eisenhower National Clearinghouse’s Digital Dozen, the MAA MathDL Digital Classroom Resources, the UK-based EEVL Internet Guide to Engineering, as a partner in the MAA’s Math Gateway NSDL project, and from MERLOT as the 2008 Classics Award as an Exemplary on-line Model for Mathematics. Below are this week's public, free, and interactive webinars through LearnCentral.org, the social learning network for education that I work on for Elluminate. Looking at the quantity of great events this week, all I can say is "Wow!" "Next Vista: The Dream Team Does A Video For You!" Next Vista Dream Team teacher Jeff Schmidt wants his students to make a video for you! Join us for what surely will be a life-changing experience. Or at least an opportunity to get a video made! "Tech Talk Tuesday - Meeting your Network - Stories from Educon 2.2" Jenny Luca, recipient of the John Ward Award from the School Library Association of Victoria (SLAV), shares with us her recent experiences and findings from attending the recent conference, Educon, USA. Educon is an innovative education conference re School2.0 and as much about conversations as technology around the future of education. "Digital Tools and Math" hosted by MSP2. Are you wondering how Glogster, Google Docs, or Scratch can be of service in your math classes? Have you seen a great way to build students' math vocabulary via podcasting? Are you looking for digital tools that can give your students more hands-on experience with algebra concepts? Get together with other math teachers to share ideas and resources to strengthen student learning in math through the use of digital tools. This will truly be a discussion and sharing session among peers. Eric Biederbeck and Tom Jenkins will moderate what, we hope, is a lively conversation! "Document Sharing: Can You Digg It? Web Applications for Research" with Rochelle Rodrigo. Although the popular image of the lone writer in the garret still persists, we know that good research is done in collaboration with others. Document sharing technologies can help researchers through all stages of the research process, from initial ideas to project presentations. "Classical Conversations" with Tammy Moore. An overview of Classical Conversations' K-5 thru 12th grade classical studies within a Biblical Worldview. It teaches parents the classical model: the tools for learning any subject and connects families with others who homeschool using the classical method. "eT@lking - Developing Personal Networks." Sue Waters shares how to develop a learning network that will ensure you are able to learn, share, discuss and stay at the edge of cutting technology. "Using Elluminate In International School Partnerships." Val Brooks showcases using Elluminate Live within an international context, sharing examples of how Elluminate has been used collaboratively and giving you the opportunity to experience some of the collaborative tools available. "Jane Bozarth's The Nuts And Bolts Of Social Media." This session will cover basics of creating and sustaining community via social media tools. Rather than theory, participants will walk away with an understanding of how to implement and utilize these applications. Briefly, we will look at several popular social media tools, such as blogs, wikis, Facebook and Twitter, then basics of using these tools for 1) Creating Community & Community Management; 2) Fostering Communities of Practice; 3) Knowledge Transfer and Management. "Twitter for Beginners" Join Lorna Costantini and Kim Caise to learn how to use the microblogging tool, Twitter. If you have never used Twitter or signed up for an account but forgot you had the account then this webinar is for you! If you are an experienced Twitterer, please feel free to refer colleagues who have never used Twitter or a microblogging tool before. "Learning Civics through Gaming: Our Courts." As the vision of Supreme Court Justice Sandra Day O'Connor, OUR COURTS is a free website offering several online games, with accompanying teacher materials, designed to teach students civics and inspire them to be active participants in our democracy. "William Kist on The Socially Networked Classroom." Join Steve Hargadon for a live and interactive interview with Bill Kist, author of The Socially Networked Classroom: Teaching in the New Media Age. Web sites like Facebook and Twitter have transformed the way young people interact and communicate. With appropriate guidelines, students’ social networking skills can be harnessed to develop new literacies and deepen teaching and learning in the 21st century. "Math 2.0: Art of Problem Solving." Richard Ruskzyk, the founder, will present The Art of Problem Solving community of avid math students. "Positioning Yourself For Job Opportunities In Social Networking And Collaborative Learning." It took organizations ten years to realize that value of e-Learning. It will only take 2-3 years for organizations to start looking for analysts, content producers, leaders, coaches, and anthropologists in the new fields. This will be a huge opportunity for e-Learning professionals to position themselves, acquire new skills and advance their careers and incomes. The session will presents early indicators on where the new careers are in demand and what skill sets, backgrounds, and specialization they require. "Riches In Niches: How To Make It Big In A Small Market: Part One" with Susan Friedmann. Learn the secrets to master your niche and maximize the reward. This session will provide you and your team with instant and actionable tools and methods to maximize your profits from a successful, unified niche marketing strategy for your business – no matter what the size. "Elluminati Connecting Classrooms." Explore how Elluminati members are experiencing tremendous success using Elluminate to connect classrooms across the hall and around the world. Coupling Elluminate with interactive whiteboards such as Promethean and SmartBoards allows students in the physical classroom to observe while their classmates near and far learn together. "How to be your Gifted Child’s Best Advocate – Supporting Your Child at Home and at School." Parenting a gifted child can be challenging. Margaret Keane and Anna Giblin of Giftedkids.ie examine ways in which parents can help their exceptionally able children at home and at school. "Edublogs Tools and Strategies - Teaching with Moodle." Join us and guest presenter Tomaz Lasic (teacher, coach & mentor). Currently at Moodle HQ where he is an interface between educators and Moodle developers, Tomaz has many Moodle stories to tell - today he will give us an overview and then throw the session open to questions (not-tech) about using Moodle "on the ground"
"VSTE Webinar: Innovators as Advocates: John Hendron and G21." Using technology to support innovative instructional practice is a great way to demonstrate the power of educational technology. Join us in our first series of webinars as VSTE begins talking about advocacy and innovation—a partnership for positive change. VSTE board members Heather Blanton (Wise County) and John Hendron (Goochland County) join forces to discuss how to jump-start grassroots advocacy through innovative classroom practices. Discussed will be the Goochland County model for inspiring change in pedagogy with a focus on twenty-first century skills: the G21 framework. "PBS & Classroom 2.0--The Buddha: Teaching Mindfulness." Filmmaker David Grubin will show clips from his new film, The Buddha, and talk about making the film and what he hopes audiences, particularly teachers and students, will take away from it. "David Hill on Demos with Positive Impact (MERLOT Series)." "Opening up Professional Development: Online Training for EFL/ESL Educators" with Benjamin Stewart. Merging professional development and e-learning provides educators not only opportunities to interact with each other but also with other educators outside the institution. This talk with present a current online workshop dedicated to EFL/ESL educators interested in discussing and practicing ways in integrating technology that promotes English as a foreign and second language learning. Participants are encouraged to share their experiences with similar courses they have had either as a teacher, facilitator, and/or learner. "Choosing and Using Video Games in the Classroom: Coaching During Play " Now that you're ready to bring the games to the classroom, how do you maximize their effectiveness as a learning tool? How can we support students during labs, yet still give them time to explore? Effective coaching and management can affect results. This is the fourth installment of the Learning Games Network's "Choosing and Using Learning Games in the Classroom" series. 9:00am Pacific Time (US) / 3:00pm GMT/UTC (intl times): Kim Caise, Peggy George, and Lorna Costantini host the weekly Classroom 2.0 LIVE! show. This week: "Earthcast 2010" with special guests Matt Montagne, Sheila Adams and Jose Rodriguez. "Designing eGames: Play Testing." Play testing may sound easy, but it is frequently one of the most difficult (and beneficial!) parts of game development. Play testing involves changing the game and rewriting rules on the fly as players react, ask questions, and provide feedback. It is important to be flexible and really listen to players’ responses to make the game more fun and effective. Then revise, edit, and revise the design plan again. This is the next session in the Learning Games' Network's Designing eGames series. LeRoy Hill hosts the regular CEN (Caribbean Educators Network) meeting. Join me for a live and interactive interview with Bill Kist, author of The Socially Networked Classroom . Web sites like Facebook and Twitter have transformed the way young people interact and communicate. With appropriate guidelines, students’ social networking skills can be harnessed to develop new literacies and deepen teaching and learning in the 21st century. Ideas on fostering collaborative learning using blogs, wikis, nings, and other interactive media. With this accessible guide for Grades 5–12, teachers of all levels of technological expertise can help students develop the new literacies necessary to succeed in a digital world. William Kist is an associate professor at Kent State University, where he teaches literacy methods courses for pre-service teachers in the area of English Education in the Adolescence to Young Adult Education Program. He also teaches graduate students in the Master of Arts in Teaching (M.A.T.) program and in Curriculum & Instruction. He has been a middle school and high school language arts teacher for the Akron Public Schools (teaching at, among other schools, his alma mater, Firestone High School); a language arts and social studies curriculum coordinator for the Medina County Schools’ Educational Service Center and the Hudson City Schools; and a consultant and trainer for school districts across the United States, both independently and as a consultant for the National Council of Teachers of English. Dr. Kist has been active on the state and national levels as a literacy educator, founding and facilitating the Ohio Language Arts Supervisors' Network and currently serving as Director for the Commission on Media for the National Council of Teachers of English. Focusing on new literacies--broadening our conceptions of "literacy" to include alternative media such as video, blogging, and text messaging—Dr. Kist’s new book,The Socially Networked Classroom, explores classroom uses of social networking in classrooms. He has presented nationally and internationally, with over 40 articles or book chapters to his credit; his profiles of teachers were the essence of his book New Literacies in Action (2005) which was chosen as a National Council of Teachers of English Select Book Dr. Kist has been sought out for interviews in the popular press regarding new literacies including such publications as Racine Journal-Times, theHartford Courant, and Education Week’s Digital Directions. Remaining active in video production work, Dr. Kist is the recipient of an Ohio Educational Broadcasting Network Commission (OEBIE) Honorable Mention for the documentary The Learning Age and a regional Emmy Award nomination for outstanding achievement in music composition for the documentary series Our Family. He has worked as a producer for the streaming video Project AdLit for the Ohio Resource Center for Mathematics, Science and Reading and is the writer/director of an independent feature Summer’s Journey, the result of a film collaboration that spans 17 years. Also, a musician, Bill's musical training began at the age of six with piano lessons from well-known local bandleader Ange Lombardi and continued through graduate school at Kent State where his teacher was Margaret Baxtresser. He currently is studying with Jackie Warren, known as “the first lady of Cleveland jazz” Throughout his career as an educator, Bill has remained active as a professional musician performing at such local establishments as Lannings Restaurant, the former Cascade Club, and the Akron City Club. Bill lives in Akron, Ohio with his wife, Stephanie. Live and Interactive with Cathy Davidson on "The Future of Thinking: Learning Institutions in a Digital Age"
Join me for a live and interactive interview with Cathy Davidson, co-author of "The Future of Learning Institutions in a Digital Age ." "Over the past two decades, the way we learn has changed dramatically. We have new sources of information and new ways to exchange and to interact with information. But our schools and the way we teach have remained largely the same for years, even centuries. What happens to traditional educational institutions when learning also takes place on a vast range of Internet sites, from Pokemon Web pages to Wikipedia? This report investigates how traditional learning institutions can become as innovative, flexible, robust, and collaborative as the best social networking sites. The authors propose an alternative definition of "institution" as a "mobilizing network"—emphasizing its flexibility, the permeability of its boundaries, its interactive productivity, and its potential as a catalyst for change—and explore the implications for higher education. "The Future of Thinking reports on innovative, virtual institutions. It also uses the idea of a virtual institution both as part of its subject matter and as part of its process: the first draft was hosted on a Web site for collaborative feedback and writing. The authors use this experiment in participatory writing as a test case for virtual institutions, learning institutions, and a new form of collaborative authorship. The finished version is still posted and open for comment. This book is the full-length report of the project, which was summarized in an earlier MacArthur volume, The Future of Learning Institutions in a Digital Age." From Wikipedia: "Cathy N. Davidson is an American scholar and university professor. She has served as the Ruth F. DeVarney Professor of English at Duke University since 1996 and has held a second distinguished chair as the John Hope Franklin Humanities Institute Professor of Interdisciplinary Studies since 2006. She has served in leadership roles at Duke and a variety of organizations and has authored or edited eighteen books. Her work for the last decade has focused on technology, collaboration, cognition, learning, and the digital age." Over the past two decades, the way we learn has changed dramatically. We have new sources of information and new ways to exchange and to interact with information. But our schools and the way we teach have remained largely the same for years, even centuries. What happens to traditional educational institutions when learning also takes place on a vast range of Internet sites, from Pokemon Web pages to Wikipedia? This report investigates how traditional learning institutions can become as innovative, flexible, robust, and collaborative as the best social networking sites. The authors propose an alternative definition of "institution" as a "mobilizing network"—emphasizing its flexibility, the permeability of its boundaries, its interactive productivity, and its potential as a catalyst for change—and explore the implications for higher education. Young people today are learning in new ways that are both collective and egalitarian. They are contributing to Wikipedia, commenting on blogs, teaching themselves programming and figuring out work-arounds to online video games. They follow links embedded in articles to build a deeper understanding. They comment on papers and ideas in an interactive and immediate exchange ofideas. All these acts are collaborative and democratic, and all occur amid a worldwide community of voices. Universities must recognize this new way of learning and adapt or risk becoming obsolete. The university model of teaching and learning relies on a hierarchy of expertise, disciplinary divides, restricted admission to those considered worthy, and a focused, solitary area of expertise. However, with participatory learning and digital media, these conventional modes of authority break down. Today's learning is interactive and without walls. Individuals learn anywhere, anytime, and with greater ease than ever before. Learning today blurs lines of expertise and tears down barriers to admission. While it has never been confined solely to the academy, today's opportunities for independent learning have never been easier nor more diverse. The authors offer ten principles that can guide universities and other institutions of learning in adapting to learning in a digital age. They focus on college-aged students, although the recommendations also apply generally for all age groups. Self-learning: Today's learners are self-learners. They browse, scan, follow links in mid-paragraph to related material. They look up information and follow new threads. They create their own paths to understanding. Horizontal structures: Rather than top-down teaching and standardized curriculum, today's learning is collaborative; learners multitask and work out solutions together on projects. Learning strategy shifts from a focus on information as such to learning to judge reliable information. It shifts from memorizing information to finding reliable sources. In short, it shifts from learning that to learning how. From presumed authority to collective credibility: Reliance on the knowledge authorities or certified experts is no longer tenable amid the growing complexities of collaborative and interdisciplinary learning. A key challenge in collaborative environments will be fostering and managing levels of trust. 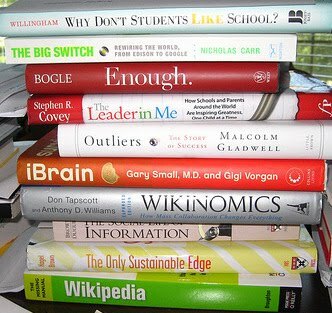 A de-centered pedagogy: To ban or limit collective knowledge sources such as Wikipedia in classrooms is to miss the importance of collaborative knowledge-making. Learning institutions should instead adopt a more inductive, collective pedagogy based on collective checking, inquisitive skepticism, and group assessment. Networked learning: Learning has traditionally often assumed a winner-take-all competitive form rather than a cooperative form. One cooperates in a classroom only if it maximizes narrow self-interest. Networked learning, in contrast, is committed to a vision of the social that stresses cooperation, interactivity, mutual benefit, and social engagement. The power of ten working interactively will invariably outstrip the power of one looking to beat out the other nine. Open source education: Traditional learning environments convey knowledge via overwhelmingly copyright-protected publications. Networked learning, contrastingly, is an 'open source' culture that seeks to share openly and freely in both creating and distributing knowledge and products. Learning as connectivity and interactivity: Challenges in a networked learning environment are not an individual's alone. Digital tools and software make working in isolation on a project unnecessary. Networking through file-sharing, data sharing, and seamless, instant communication is now possible. Lifelong learning: The speed of change in this digital world requires individuals to learn anew, face novel conditions, and adapt at a record pace. Learning never ends. How we know has changed radically. Learning institutions as mobilizing networks: Rather than thinking of learning institutions as a bundle of rules, regulations, and norms governing the actions within its structure, new institutions must begin to think of themselves as mobilizing networks. These institutions mobilize flexibility, interactivity, and outcomes. Issues of consideration in these institutions are ones of reliability and predictability alongside flexibility and innovation. Flexible scalability and simulation: Learning institutions must be open to changing scale. Students may work in small groups on a specific topic or together in an open-ended and open-sourced contribution. These ten principles, the authors argue, are the first steps in redesigning learning institutions to fit the new digital world. By assessing some of the institutional barriers to change, the authors hope to mobilize institutions to envision formal, higher education as part of a continuum of the networked world that students engage in online today.